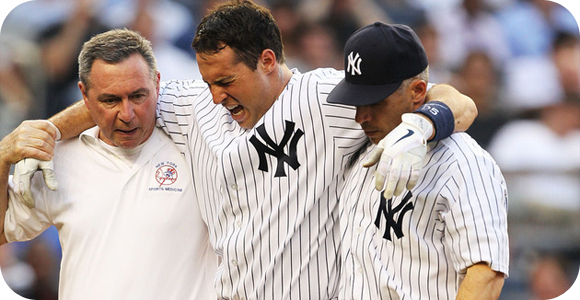 The New York Yankees have not had good luck when it comes to injured players, but despite this sportsbooks still make them the favorite. With the most recent injury of their first baseman, Mark Teixeira, this has not changed the fact that the Yankees are given the better odds of winning against the Boston Red Sox on Tuesday, September 1 at 7 p.m.
Teixeira was taken out of a game due to a leg injury, where he bruised his shin when he fouled a ball off his shin in the sixth inning of a game against the Minnesota Twins at Yankee Stadium. However, it seems things are worse than a simple bump. Manager Joe Girardi revealed that they would continue in their series against the Red Sox without the help of Teixeira, who was instead, sent back to New York. With first base left unmanned, Girardi is considering to put Alex Rodriguez at first base as a possible option. Let’s hope the rest of the team can make do without the potential MLB MVP, thanks to his consistency when up to bat.